A trade union movement originating in the Polish shipyards of Gdansk, Solidarity became the focal point for anti-communist resistance within the Eastern bloc. Solidarity quickly moved beyond a simple worker’s movement and rallied pro-Catholic, intellectuals and other social dissidents to its banner. Its toleration within a Warsaw Pact nation was unprecedented, and involved a cat and mouse game heavily reliant on public scrutiny of Soviet intentions, the prestige of the Polish Pope, John Paul II, and the political courage of its leader Lech Walesa. While Poland’s communist led government under Wojciech Jaruzelski did crack down on Solidarity and imprison much of its leadership, the organization went underground and began to regrow. By 1988, Solidarity led strikes had forced the Polish Communists into open negotiations. 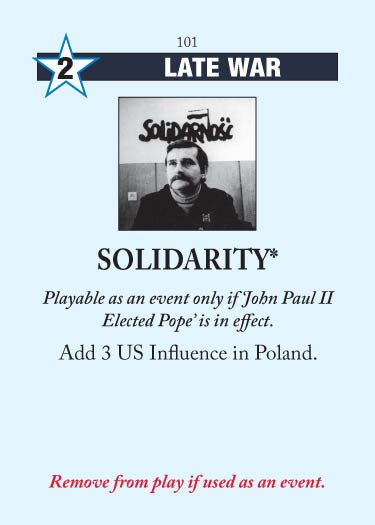 Assuming that John Paul II has been elected Pope, then Solidarity falls into the “empty action round” category of US events; it’s worth sending to space, but you can also just repair its damage (assuming you’ve overprotected Poland). The main drawback of repairing rather than spacing is that it makes you more vulnerable to East European Unrest: if the US only has their John Paul II Elected Pope influence in Poland, then EEU can’t grant them control no matter how many times they play it. The main advantage of playing it for Ops is that you might be able to later use Warsaw Pact Formed to more efficiently purge eastern Europe of all US influence. Regardless, it is annoying no matter what to draw Solidarity, which is even further reason to send John Paul II to space if you draw it. A fine event, suitable for AR7 or headline, especially if you can combo it with Truman Doctrine or some other Europe-affecting event (Chernobyl, East European Unrest, etc.). It even works well with Tear Down This Wall by potentially removing a USSR modifier on East Germany realignments. And as noted earlier, Solidarity is a great way to establish enough influence in Poland so that a subsequent East European Unrest can grant you control. I do always try to play John Paul II for the event; even if I don’t draw Solidarity later, or don’t intend to contest Poland, it’s still nice to leave a strong US event in the deck. This entry was posted in Late War, US Events and tagged solidarity. Bookmark the permalink. It gives 3 influence for the US being 2 Ops card itself. How can you just repair the damage? The assumption is that you have already overprotected Poland, or that you overprotect it the AR before playing Solidarity. I’ll clarify. I got the assumption but I would not call replacing overprotection with just control ‘repairing damage’.